Iris comes in white, yellow, purple, and blue shades. It comes directly from the farm for the maximum amount of freshness. It is an exotic flower with intensely colored blossoms of unusual shape. It is made up of three inner petals arching up and down three outer petals falling down. When fully blossomed, they are beautiful when arranged in their natural state. Its name originates from the Greek word for rainbow. It is full of passion, friendship, wisdom, and faithfulness. It is also used to express sympathy, hope, and to give well-wishes. It is available year round and is the perfect flower to harmonize or to let someone know how much you care about them during an important event in their lives. The Iris flower is named after the Greek goddess of rainbows and love.Iris flower is an umbrella term for 200 varieties of a spectacular flowering plant. Its beautiful structure is unique and eye-catching. They come in several colors. 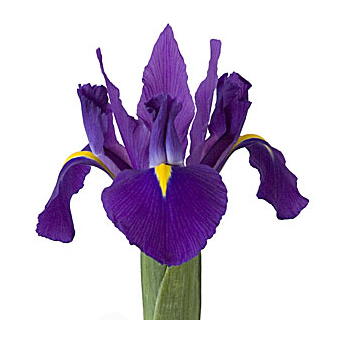 On its own, the iris flower is a show stopper, with its gradient petals and leafy stems. These flowers have been the muse of painters since ancient times. It was often connected with royalty. These flowers are bulbous and leafy. A bouquet of only Irises is impressive by itself. But when used with other flowers they balance out the shape and palette of the flower arrangement. If you wish to convey your feelings of affection, appreciation or sympathy, then these are the perfect flowers for you. If you’re aiming for a simple, classic look to your home décor, the Iris flowers are the perfect addition. The Iris flower comes in a number of varieties. The flowers consist of three petals that stand upright and three lower petals that fall in a curve.Iris flowers can be as broad as 4inches or 7 inches. They come in several varieties. The bearded varieties are tall and lush and the most popular of Iris flowers. They are the most visually stunning. A few stems or flowers of Iris Germanica are the perfect gift to a well-loved guest. When kept in a plain vase they will focus the attention on the blooming flower. The beardless varieties are elegant and straightforward but no less beautiful. 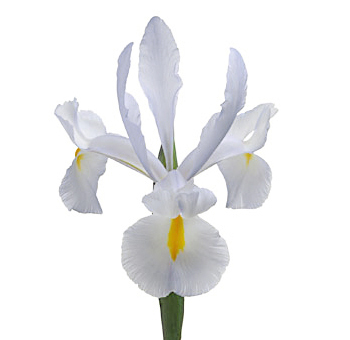 They possess a quiet and effective charm.The Iris USA bloom in Louisiana Iris and have an elegant look. Their dark flowers often have a splash of bright yellow on their petals. They are beautiful in bunches with tulips and daisies. Irises can serve a large number of occasions because of its wide variety. You can use the lovely Japanese Iris for its soft profile. Iris flowers can grow up to 36 inches in height. Their stalks are sturdy and sometimes encased in many leaves close to the flower. A handful of Iris USA flowers in bloom can transform an everyday setting. Its soothing colors can convey deep meanings of faith and affection to loved ones. They represent hope and friendship. These are perfect to express your appreciation for loved ones and colleagues alike. The wide range of colors makes the Iris flowers a versatile element in bouquets and decorations. The colors range from purple to red Iris Flower. There are yellow Iris flower and even black. Purple Iris flower convey wisdom and faith. These are the perfect gift for a milestone. You can use them to express your appreciation too. 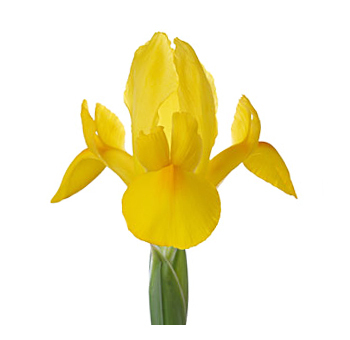 Yellow irises convey a message of passion, which is fitting for an anniversary. White irises stand for purity, and these can be used to comfort a loved one in times of distress. Blue and violet irises were used for royalty in Japan and other countries. Regardless of the combination of colors, the irises stand for elegance.Many varieties of the Iris flowers often have more than one color on their petals. You will often see deep purple Iris flowers with a dash of yellow in the middle. You can also see flowers where the colors fade from yellow to white. Intricate textures of two different colors give the Iris flowers an impressive look. Siberian Irises often have amazing white textures on their blue and purple petals. The iris flowers are hardy. Their bloom lasts for a long time. These bright flowers add splendor to any occasion. They are perfect for centerpiece attractions. You can even use them in garlands. When paired with the right flowers they can transform the look of a bouquet. Using darkly colored Irises with brighter colors like yellow and red creates a beautiful look. These flowers are perfect for adding elegance to home parties. They are simple yet extravagant. Their deep green, long leaves create a soothing background with the flowers. A cluster of Iris flowers is sure to amaze guests because of its elegance and lovely shape. Iris flowers work best when they are fresh. These flowers are best when used in their natural state. When arranged in full bloom with flowers such as peonies and lilies, they can really highlight the other flowers and bring a burst of color to your home. But for the best look, they must be fresh and fully bloomed. For this reason, you must buy iris flowers from florists that freshly cut them. If you’re looking to buy fresh Iris flowers online, Whole Blossoms is perfect for you. Their delivery of fresh flowers never disappoints. 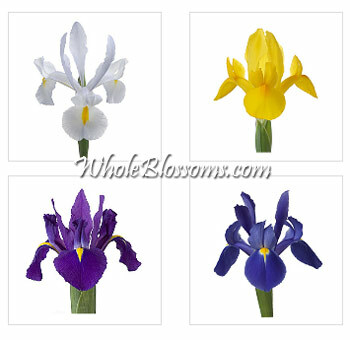 You can order wholesale iris flowers online to be delivered at your doorstep, 24/7. 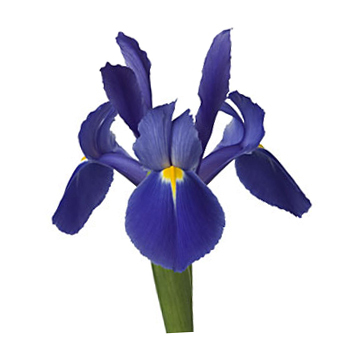 Iris flowers are the perfect gift for achievements and to remember fond memories. These vast, lush flowers will leave a long-standing impact when you gift them to anyone. And if you simply want a stylish look to your cozy home, a few Iris flowers are enough!